Lower concentrations of local anesthetics are typically used for infiltration anesthesia. Variation in local anesthetic dose depends on the procedure, the degree of anesthesia required, and the individual patient's circumstances. Reduced dosage is indicated in patients who are debilitated or acutely ill, in patients who are very young or very old, and in patients with liver disease, arteriosclerosis, or occlusive arterial disease. Infiltration anesthesia is accomplished with administration of the local anesthetic solution intradermally (ID), subcutaneously (SC), or submucosally across the nerve path that supplies the area of the body that requires anesthesia. [4, 3] See the image below. Infiltration of a local anesthetic. Concentrations: Drug concentration is expressed as a percentage (eg, bupivacaine 0.25%, lidocaine 1%). Percentage is measured in grams per 100 mL (ie, 1% is 1 g/100 mL [1000 mg/100 mL], or 10 mg/mL). Dilutions: When epinephrine is combined in an anesthetic solution, the result is expressed as a dilution (eg, 1:100,000). Chemical structure of commonly used local anesthetics. Chemical structure of the 2 classes of local anesthetics, amino esters and amino amides. Dose, physiochemical variables, and pharmacokinetic properties of local anesthetics used for infiltrative injection (nondental use) are portrayed in the table below. A simple way to help remember which class a local anesthetic belongs to is to remember that the letter “i” appears twice in the spelling of an amide. 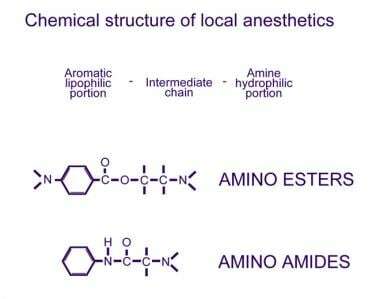 Local anesthetics with a PABA ester-type structure seem to cause most anesthesia-related allergic reactions. Documented cross-sensitivity has been exhibited within the ester-based local anesthetics and structurally related compounds (eg, paraben preservatives). Hypersensitivity to the amide local anesthetics is rare. Patients who claim to be allergic to lidocaine may actually be allergic to the preservative methylparaben. Preservative-free lidocaine may be obtained from individual ampules of lidocaine or from preservative-free lidocaine used by cardiologists and anesthesiologists. pKa level is the primary factor that determines onset of action. A lower pKa level increases tissue penetration and shortens onset of action; this is because of the more lipid-soluble nonionized particles. A pKa level that is lower than the pH level optimizes penetration. Inflammation in the extracellular space may decrease the pH level and may slow onset of action. The site of administration influences onset (ie, onset is prolonged in areas with increased tissue or nerve sheath size). Anesthetics with high partition coefficients that increase lipophilic properties pass easily into the lipid nerve membrane. The higher degree of vasodilation promotes vascular absorption, thereby reducing the locally available drug and decreasing potency. The addition of epinephrine or sodium bicarbonate increases the pH level, thereby increasing nonionized particles, which are more lipid-soluble. Generally, anesthetic solutions that contain premixed epinephrine contain preservatives; these solutions have the pH level adjusted lower to maintain stability of the epinephrine and antioxidants. The addition of epinephrine to some local anesthetic solutions prolongs duration of action by causing vasoconstriction and decreasing systemic absorption. The degree of protein binding primarily determines the duration of action; high protein binding increases the duration of action. Increasing pH level (by addition of epinephrine or sodium bicarbonate) prolongs duration of action. The table below summarizes amides for infiltrative injection. Achar S, Kundu S. Principles of office anesthesia: part I. Infiltrative anesthesia. Am Fam Physician. 2002 Jul 1. 66(1):91-4. [Medline]. Heavner JE. Local anesthetics. Curr Opin Anaesthesiol. 2007 Aug. 20(4):336-42. [Medline]. McGee D. Local and topical anesthesia. Roberts JR, Hedges J. Clinical procedures in emergency medicine. 4th ed. Philadelphia, Pa: WB Saunders; 2004. 533-51. Local anesthetics. McEvoy GK, Miller J (Editors). AHFS Drug Information (2008). Bethesda, Md: American Society of Health-System Pharmacists, Inc; 2008. Wolters Kluwer Health, Inc. Injectable local anesthetics. Drug Facts and Comparisons. eFacts [online]. 2007. Davies T, Karanovic S, Shergill B. Essential regional nerve blocks for the dermatologist: part 1. Clin Exp Dermatol. 2014 Oct. 39 (7):777-84. [Medline]. [Full Text]. Davies T, Karanovic S, Shergill B. Essential regional nerve blocks for the dermatologist: Part 2. Clin Exp Dermatol. 2014 Dec. 39 (8):861-7. [Medline]. [Full Text]. Hu P, Harmon D, Frizelle H. Patient comfort during regional anesthesia. J Clin Anesth. 2007 Feb. 19(1):67-74. [Medline]. Latham JL, Martin SN. Infiltrative anesthesia in office practice. Am Fam Physician. 2014 Jun 15. 89 (12):956-62. [Medline]. [Full Text]. Al Shahwan MA. Prospective comparison between buffered 1% lidocaine-epinephrine and skin cooling in reducing the pain of local anesthetic infiltration. Dermatol Surg. 2012 Oct. 38(10):1654-9. [Medline]. Tetzlaff JE. 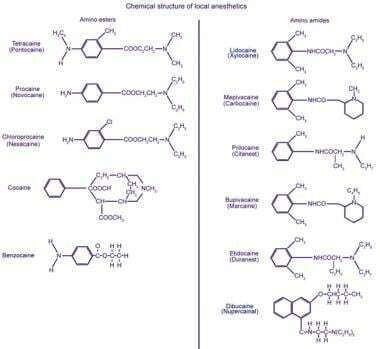 The pharmacology of local anesthetics. Anesthesiol Clin North America. 2000 Jun. 18(2):217-33, v. [Medline]. Howland MA. Pharmacokinetic and toxicokinetics principles. Flomenbaum NE, Goldfrank LR, Hoffman RS, Howland MA, Lewin NA, Nelson LS (Editors). Goldfrank's Toxicologic Emergencies. 8th Edition. New York, NY: McGraw-Hill; 2006.